India is experiencing an unprecedented rise in the number of breast cancer cases across all sections of society. Unfortunately India also has one of the worst survival rates in the world, ranking highest for total number of women dying from breast cancer, and also for the number of healthy life years lost to the disease. Early detection and treatment is critical for improving survival rates. CRS organised two community awareness events on 23rd and 29th August. 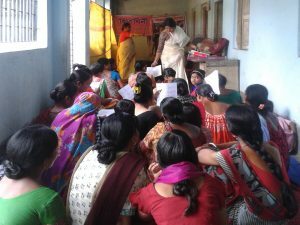 42 women from BD Colony and 52 women from Dum Dum gathered to find out about more. Presentations were given by representatives from Hittaishini, a voluntary breast cancer support network whose members are all breast cancer survivors. The key message of the day was that breast cancer is not the end of the road.